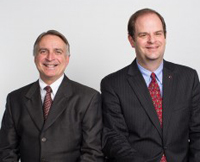 Pictured (from left to right): Alan Grossnickle, director of the William P. Gordon Institute for Enterprise Development, and Dr. Jeffrey Fawcett, dean of the School of Business and professor of marketing at Grace. The Grace College School of Business and the Gordon Institute for Enterprise Development are collaborating with the Ewing Marion Kauffman Foundation to host a FastTrac New Venture class, a 10-week seminar offering key knowledge and resources to small business owners in the community. Taught by school of business faculty who are certified to teach Kauffman courses, the program will run January 20 to March 24 and will be held Monday evenings at the Ronald and Barbara Manahan Orthopaedic Capital Center. Designed specifically for entrepreneurs in the early stages of business development, FastTrac New Venture classes aim to help potential or established business leaders to begin building an infrastructure for business operations, explore the risk and success factors in the market place, understand how to access the human, financial and business resources, network with entrepreneurs and professionals, respond to changes that can impact business, and build an actionable business plan. “The Grace College School of Business is excited to be able to partner with local businesses to help them meet the challenge of today’s marketplace,” said Dr. Jeffrey Fawcett, dean of the School of Business and professor of marketing at Grace. FastTrac programs are delivered by a variety of affiliate organizations, both non-profit and for-profit alike, including chambers of commerce, business development centers, local and regional economic development councils, colleges, universities, consulting firms, and many others. By helping entrepreneurs succeed, FastTrac programs contribute to building and sustaining strong, vibrant communities and economies.